Welcome to The Fourth Wall, CHIRP's weekly e-conversation on cinema. 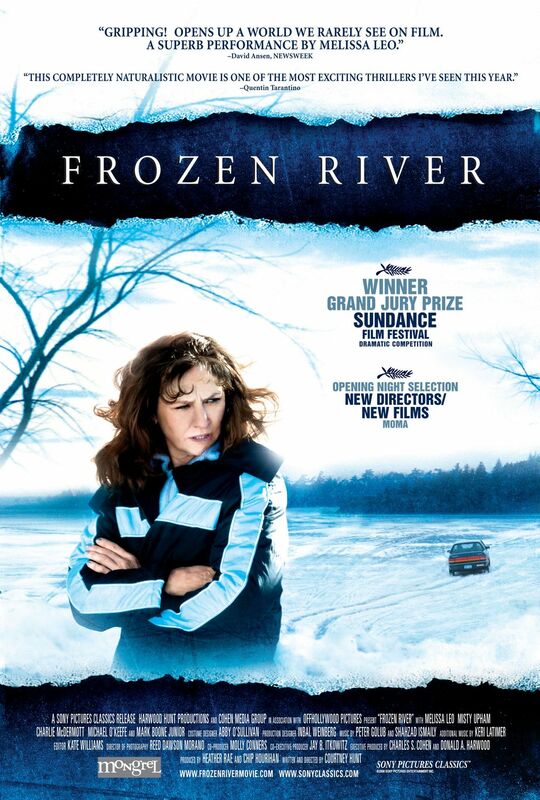 This week's subject is the 2008 crime drama Frozen River. Kevin: While I can count many, many tiers of wealth separating my own lifestyle from that of Pure Opulence, a middle-class existence seems mighty lavish when compared to the dreary day-to-day survival of Frozen River. Strap yourselves in, folks... and be thankful that you have more than Tang and popcorn awaiting you for breakfast in the morning. Ray Eddy (Melissa Leo, in an Oscar-nominated performance) lives with her two sons in a battered trailer at the edge of civilization in snowy, upstate New York -- and her deadbeat husband has just absconded with what would've been the down payment on a shiny, new "double-wide" mobile home. Christmas is coming, the cupboards are bare, and through happenstance, Ray stumbles upon Lila (Misty Upham), a member of the nearby Mohawk tribe. Lila ekes out her own living by helping to smuggle illegals across the Canadian border via the frozen St. Lawrence River. The two women become partners out of financial desperation, and each successive trip feels like another round of Russian Roulette. Is this the time when the icy river cracks? Are the state troopers wise to the whole operation? And what happens when Pakistanis show up to be smuggled, as opposed to the customary Mexicans and Chinese? The issue of illegal immigration is certainly a contentious political hot potato, but this film doesn't attempt to take any moral stance. We never get to know any of the folks who stow away in Ray's trunk; they're simply a job to her, and one that pays much better than her dead-end gig at the local discount store. In this, Frozen River takes a different tack than The Visitor, released one year earlier (2007) and focused much more on the plight of an illegal immigrant who's already established a life in the States. The latter, while well made, seemed like a traditional Hollywood creation -- "see how the Syrian immigrant helps the old, stodgy, white professor rediscover life!" Cue up a random arrest, and a subsequent series of entanglements with immigration law and detention centers. Frozen River felt like more of a tale of Quiet Desperation than anything else? Though you get the feeling that Ray saw smuggling people as somewhat more acceptable than, say, smuggling drugs. She does have a conscience -- as evidenced by her decisions at the conclusion of the film. Let's start with the moral compasses of all involved here. Were there any "good" characters? Do we see the state troopers as adversaries here, even though they're simply doing their jobs? Did you walk away thinking any differently about the issue of illegal immigration? Clarence: Is is okay to steal a loaf of bread if you're starving? That was one question I thought of while watching this fantastic film. I really enjoyed both Leo's and Upham's performances. Director Courtney Hunt's tight framing really brings the characters up close. Leo's face immediately reminded me of that famous Depression-era photograph of Florence Owen Thompson, setting the mood for this story better than any dialogue could. The unprissy fierceness of the character was fascinating to watch. Ray is not Walter White. She's not committing crimes for fun or to prove her superior intellect, and she's not trying to score stacks of cash so she can live in a mansion or set up her family on Easy Street for life. She just wants that double-wide, and she's confined by a limited set of choices and a ticking clock. That being said, Ray has very much bought in to the atmosphere of American consumerism, symbolized by the Hot Wheels toy set her younger son wants for Christmas. It's also telling when her son mentions all the cosmetics she buys when she does get her hands on some cash. Lila's circumstances are little fuzzier, but they also center around her family. Living in a trailer that somehow manages to be smaller and sadder than Ray's, Lila's already rolled the dice and crapped out several times before this story starts. Lila's cultural perspective as a Native American is interesting. Kids don't have to have toys. But buying things, even if they aren't necessary for survival, is part of what being an American is all about. I definitely didn't feel like the cops were doing anything other than their jobs, which is a marked contrast to a lot of American movies where the police are the dogged and single-minded Pursuers of Justice. As much as we hear about the "bad apples" (as we should), police are people just like anyone else. At one point in the film Ray's son starts dabbling in illegal activities that capture a cop's attention. The outcome of that story line at the very end of the movie was a genuine (and welcome) surprise to me. Growing up in Nebraska, illegal immigration has always been somewhat of an abstract concept to me. But the recent political rhetoric about making it harder for people to come to this country have highlighted for me the need to help people in desperate straits rather than treating them like criminals. Watching this movie got me thinking about not just immigration but the whole American underground economy, which is is hard to measure but is estimated in the hundreds of billions of dollars. Smuggling, drug dealing, credit card fraud, and prostitution are clearly illegal, but then again so are practices like withholding wages, paying employees "under the table" to avoid taxes, and ignoring workplace health and safety practices. All of this his happening all the time in our country. Maybe part of living in the ultimate capitalist society involves constantly testing how much you can get away with? Kevin, I'm going to ask you to play judge for a moment. Let's say that Ray and Lila got caught on their first run across the river and were immediately arrested and sent to trial. If you were sitting on the bench, what factors would you take into account in determining their guilt or innocence, as well as what sentence they should get? Also, going back to Melissa Leo's vivid portrayal of the character, I have to ask a question that probably reveals my own biases - Do you think Ray would have voted for Trump? Kevin: Clarence, your opening question reminded me of this classic exchange between Bart and Fat Tony on The Simpsons... I don't begrudge Ray wanting to provide a Hot Wheels set for her six-year-old, but don't we lose a little sympathy when it's clear that she has money for cigarettes but not food for her kids? OK, I've put on my judicial robes -- what factors would I take into account re: sentencing if they'd been caught on their first run? I think letting Ray go with a fine and a stern warning/threat would be appropriate, but Lila was a repeat offender and thus would deserve a jail sentence. (And I'd label Ray as a repeat offender by the conclusion of the film, since she was already directly warned by the troopers once, and was specifically told that they knew her "friend" was involved in the operation.) As far as determining guilt, I don't think it gets any more cut & dry when you have people stowed away in the trunk. Should I cut them slack because they were broke? That's a slippery-slope argument towards excusing a whole bunch of criminal activity. Sure, it's a "victimless" crime -- but what if they had been the pawn of a terrorist organization that was transporting dangerous people? If I were the troopers, though, I'd want to also poke into exactly how much the Mohawk police knew about the whole operation. While the film stated that the tribe had jurisdiction, it didn't go into what would've resulted if the tribal council had refused the troopers' "request" for either Lila or Ray to eat the charges. If the Mohawks weren't going to police their own border with Canada, what then? Do I think Ray voted for Trump? Yes, but only because she fit the demographic: white woman, over 45, non-college-graduate. There's nothing else that would lead me to believe she'd be strongly partisan in any direction... and there's a decent chance she may simply be apolitical in general. Also, you seem to be suggesting that smuggling and black-market operations don't thrive in non-capitalist countries? I'd argue the opposite -- that they're even more prevalent in areas which are more restrictive! (Forget blue jeans, how 'bout a kidney for sale?) Natural supply-and-demand creates a market, whether or not the society is structured for one; the only difference is that in non-capitalist countries, the beneficiaries of such markets are more likely to be criminals. I was thinking about other films I've seen involving Native Americans, and coming up embarrassingly short; I'm sad to say that I have little knowledge of modern-day tribal life in general. What's worse is that I can conjure up only simple Native American stereotypes when thinking of stock characters. (Long hair, nature-oriented, contemplative, etc.) Sheesh. How about you? Clarence: Yeah, I was trying to think of the last film I saw that featured Native Americans, and I drew a blank as well. I remember marveling at Atanarjuat: The Fast Runner, a film based on an Inuit legend, but that was produced out of Canada and didn't receive a wide distribution. I know next to nothing about Native American life beyond the occasional Atlantic article lamenting the cycle of poverty and despair that continues to plague tribes. An extremely narrow view, to be sure. This is one of the reasons that media outlets like public television are so valuable. Even if it's just a half-hour video documentary, public TV gives people a chance to tell their own story to those who want to listen. I'm almost of the same opinion as you as far as how the two main characters should be legally treated, although I'd be inclined to go a little easier on Lila. I don't mind admitting it's because I felt a lot of sympathy for her situation. I think massive amounts of some kind of community service would be in order, maybe working with troubled kids like Ray's son. In movies, I find the small-time operators of large criminal operations to be very interesting. As Scorsese depicted beautifully in Goodfellas and Casino, large crime operations can't work without the minor players and ''civilians" who get thrown a few bucks to help out, even if it's just to look the other way at the right time. Like Ray, they do not think of the complications that may occur, just the immediate risk/reward assessment in front of them. It's a guaranteed effective formula for thrillers and noirs of all kinds. You're absolutely right about black-market operations in non-capitalist countries. I can't believe I blocked out goings-on in, say, Russia and the Middle East. Is it safe to say that pretty much any sovereign state has some kind of hidden economy thriving alongside the legit businesses? It's interesting that there have been several fictional stories about middle-class folks striving to win the illegal empire-building game (Breaking Bad, Weeds, Queen of the South, etc.). I like movies like Frozen River that focus on the minor cogs in the machine and find the drama in their lives as they try to get their (small) piece of the action. Share May 26, 2017 • http://chrp.at/1pHG • Share on Facebook • Tweet This!